For medal collectors the Second Anglo-Boer War One offers a very rich field of choice. The Naval Brigades – the sailors of the Royal Navy who served ashore in support of the Army are one such example. The Navy provided long range 12pdr and 4.7 inch guns to counter the Boer’s own artillery that out-ranged anything the British Army had. The exploits of the Naval Brigade is the stuff of legend, the Victorians loved their “handy man ashore”. The famous Naval Gun Race of the now defunct Royal Tournament originated from the Navy’s handiwork of turning ship’s guns into movable land based guns. The joy of collecting medals and researching them is that they often provide unexpected information and knowledge. The War was in many ways the centre of a transitional period and the men and women who served were either veterans or would go on to be part of more history. One such example is Able Seaman 156753 FR Clark HMS Doris, was later in his career was one of the first seaman of the Naval Service of Canada in 1910, retitled Royal Canadian Navy in 1911. Frederick Robert Clark was born in Stonehouse, Devon in 1875. He worked as a “printer’s boy”, but obviously this was not enough. In August 1890, aged 15 he enlisted for the Royal Navy. He and the Navy liked each other, on his 18th birthday he was made Ordinary Seaman and a year later he was promoted Able Seaman. In late 1897 he married Emily Bellamy in East Stonehouse. Soon after Clark joined HMS Doris in November 1897 on the ship’s first commission which was to be on the Cape Station, i.e. based in Simonstown, Cape Colony. Doris was a 2nd class cruiser of 5,600 tons, amongst her armament were 8 12pdr and 6 4.7inch guns that would prove so useful in 1899. Up to the outbreak of war HMS Doris cruised the west and east coasts of Africa. On the outbreak of war in October 1899 HMS Doris provided men for the first Naval Brigade (initially without guns) to provide two garrisons in the central Cape. When it was realised naval guns were needed one garrison was withdrawn and equipped with guns to join General Lord Methuen’s Kimberley Relief Force. However Clark did not join a Naval Brigade until January 29, 1900. The first clasp he received for his medal is Paardeberg (February 1900). Clark probably served in “Grant’s Guns” (named after Commander WL Grant, HMS Doris), of which there were two 4.7 inch guns. One gun manned by HMS Doris sailors known as “Little Bobs” (after the army commander Field Marshall Lord Roberts, nicknamed “Bobs”). The other gun was served by sailors from HMS Barrosa. Grant’s Guns served with Lord Roberts’ army at Paardeberg, Driefontein (March, 1900), the capture of Bloemfontein, Johannesburg, Pretoria (June 1900) and the advance to the Portuguese East Africa border (September 1900). In October the Naval Brigade returned to their ships. In January 1901 a large party was landed ashore to counter a Boer attack on Port Elizabeth, the attack never developed and the men returned to ship. HMS Doris returned to England in April 1901. 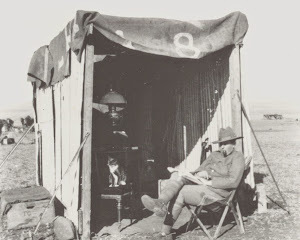 Clark was awarded the QSA with four clasps; Paardeberg, Driefontein,Cape Colony and Transvaal. In March 1905 Clark’s 12 year service commitment ended and he transferred to the Royal Fleet Reserve (RFR). In 1910 plans were laid to create a Canadian navy. A college was set up in Halifax, Nova Scotia and two ships purchased from Britain; HMCS Rainbow (Apollo class cruiser 3,600 tons) based at Esquimalt British Columbia and HMS Niobe (1st class cruiser 11,000 tons) based at Halifax. Niobe had also served in the Anglo-Boer War. Meanwhile, back in England, Clark signed up under the “Canadian Naval Service Agreement” in September 1910 for five years. HMCS Rainbow had been commissioned in August and Doris in September, so Clark came across in Doris and arrived in Halifax on Trafalgar Day, 21 October 1910. In March 1911 he re-qualified as a Torpedo Man. In August 1911 Niobe ran aground on Pinnacle Rock, off Cape Sable NS, HMS Cornwall came to assist but also ran aground. Clark’s service in the new navy did not last five years, his Canadian service papers note “SNLR” – services no longer required, he received a gratuity of what looks like $24.00. In November 1911 he was sent home on HMS Cornwall. Clark re-joined the RFR back in Devonport in December 1911. At the outbreak of World War I Clark, still serving in the reserve, was sent to HMS Isis, an aged cruiser. Clark was posted ashore in June 1917. His next ship was the newly commissioned HMS Pegasus, a new-fangled sea plane carrier. Clark was demobbed in April 1919, a month before Pegasus sailed to support British forces in North Russia. It is not known what occupation Clark had after he left the Navy. He died in 1926 in Devonport, Devon.